So after making my commitment to Fill in the Blank Friday, Lauren who usually creates the prompts decided it was time for a break! I am a little crushed actually. I mean, I know I missed Friday, but it's only Saturday in America and its Sunday in Australia, but that's no matter. I was devoted enough to remember and go to the site and check for this week's blanks. And to be completely honest, after last Friday's blanks, I wanted more blanks on Saturday and Sunday and Monday! I love fill in the blanks (that have no correct answer)! So, since there are no new blanks this week, I will go back in time and find some blanks from a prior Friday. My bedtime routine includes: Talking to Teh Bear until it is time for me to get off the computer. Then I take Teh Phil out for one last business session. Then I go business myself. Then, depending on how tired I am, I will read a chapter or few from whatever book I am currently reading. After turning off the light, I ensure my alarm clock is set for the time that I have to get up (which changes depending on my schedule for the next day, and lets be honest, Teh Phil always lets me know when its time to get up). Then I roll over and snuggle all my pretend Teh Bear pillows and try to fall asleep. I can't stand stinky things because I have a very sensitive smeller, apparently. My idea of relaxation would be snuggling with Teh Bear. If I had an extra $50, I would have an extra $50. I don't really have a monthly budget (I know, bad Teh Megan!) but I just try to limit my spending as much as possible. If I don't need it, it stays at the store for the most part. Except for dog toys. I'm a sucker for spoiling Teh Phil. But I've curbed my clothes spending problem, which was a relief! The best thing about a bloggy friend is learning new things? I'm not really sure, I don't get a lot of comments on my blog since I mostly blog about my personal life and I'm not so sure that many people are that interested other than people that actually know, know me. I guess, I'll be going back in time to do my fill in the blanks until new blanks start coming out again. Luckily, Lauren has been doing these for a year, so I have 52 weeks worth to choose from! YAY, blanks! Also, I did do some Scotland photo edits (since I've had a lot of free time on watch). I'll be uploading those via the free internet since I'm limited in my data usage and I'm trying to conserve it and not spend it all in one place not use it all by being excited about reconnecting to my lifeline. Patience is a virtue so I'm told... Not my virtue of course, so I understand if you, my Gentle Readers, are like, "I quit reading your blog cause you're sooo slow!" I'd be sad, but understanding. 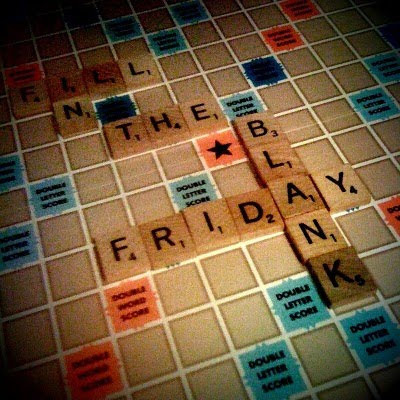 So I take it you found out about Fill In The Blank Friday from me? Lol where's my credit?? Haha!